What can I do with CSV2OFX (CSV/XLS/XLSX to OFX Converter)? Why should I trust CSV2OFX? Yes. CSV2OFX is free to download and try. Your file will be fully parsed in the trial mode, so you can verify that CSV2OFX understands your transactions file correctly. You can create a fully functional and loadableOFX file before purchasing (with limitation to 10 transactions - this limitation is removed after you register). Do you have a sample CSV file to help me started? Yes. Please use the following CSV file. CSV2OFX can parse your CSV file much easier with expected column names. I have an Excel file? Do I need to convert it to CSV? In most cases no - all CSV converters can read Excel (XLSX and XLS) files. If you Excel file has multiple sheets and transactions are not on the first sheet, then yes, you need to convert to CSV the sheet with transactions. What structure(layout) must a CSV/Excel file have? The first line should be the header - column names in common English like date, amount, payee, memo, check number. Every other line should be one transaction. 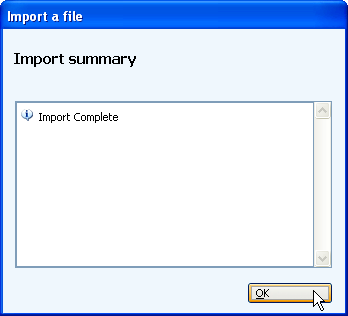 What is a transaction in a CSV file? Transaction takes one line in the CSV file and must have date, amount, description, optional payee/r and check number. Is there difference between bank and credit card transactions? How I should import a OFX file that CSV2OFX created into MS Money? 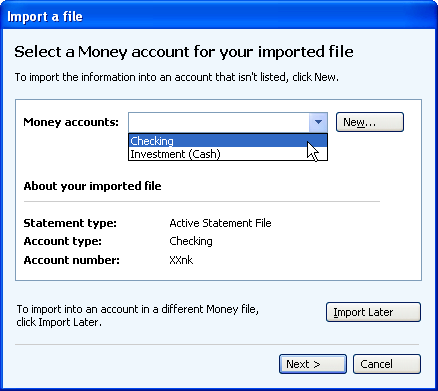 Start MS Money and click File, then Import, then Import, then Downloaded Statements. 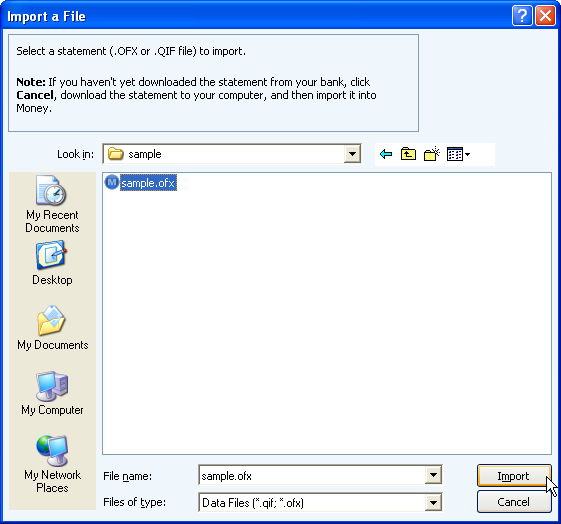 On the file dialog, navigate to the folder where you saved a OFX file, select it and click Open. 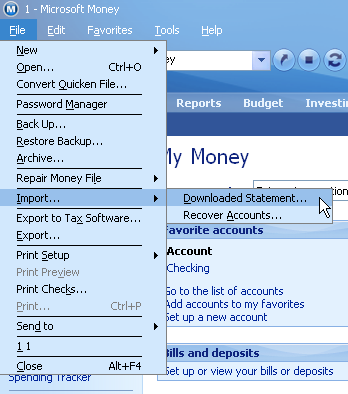 On the import screen, select an account from the account drop down list or select to create new account. Review your imported transactions (Done! ).